This is what it’s all about. It’s all about the land what this map shows you. I must say it’s pretty shocking when you present it in this way. What it clearly shows is that if there’s no peace agreement between the Palestinians and Israel, more of those green areas, more of that Palestinian land will be eaten up by Jewish settlements. Although right now there is a freeze on settlements by Israel, because there’s so much international pressure, the Palestinians say, if we don’t have peace, soon we won’t have a Palestine left. But it’s not just the first map. 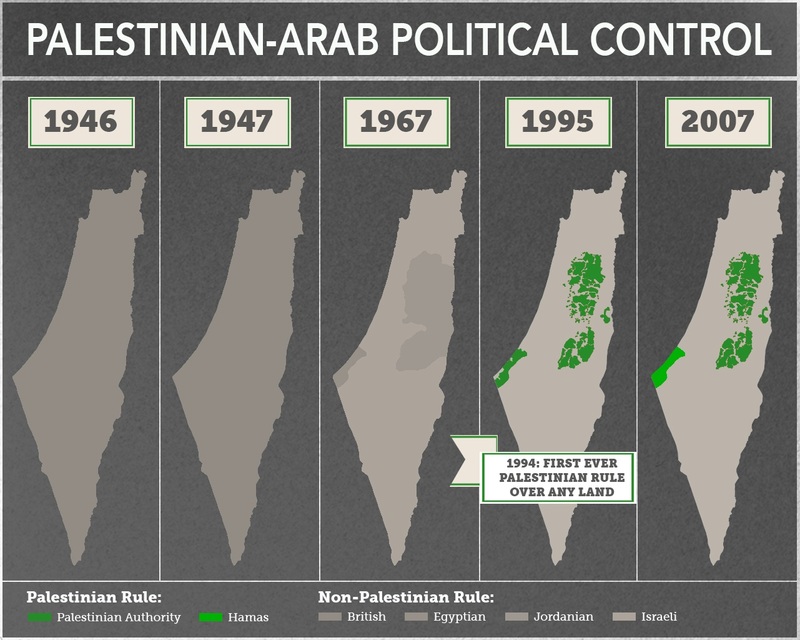 The “1946” panel ignores the fact that the territory in question in fact wasn’t Palestinian-controlled in 1946, but was under British Mandatory rule until May 1948. The second map signifies . . . well, nothing at all, since the U.N’s proposed 1947 partition never took effect (because Palestinian leadership rejected it). The “1949-1967” panel, which shows the “armistice lines” from Israel’s War of Independence that persisted until Israel’s victory in the 1967’s Six Days War, neglects to mention that the Gaza Strip and the West Bank were administered not by Palestinians but by Egypt and Jordan, respectively. And while the “Present” map rightly shows Palestinians in control of territory, the division of authority in the wake of the 1995 Oslo II accords and Israel’s “disengagement” is so complex as to make this map useless. Taken together, what we have is not four maps in a chronological series, but four different categories of territorial control presented with varying degrees of inaccuracy. Those categories are private property (“1946”), political control (“1967” and “[Present]”), and international partition plans (“1947”). They are presented in a fashion that is either tendentiously inaccurate (“[Present]”), essentially mendacious (“1947” and “1967”), or radically untrue (“1946”). That suggests a rather different story than the preferred one of uninhibited Israeli rapacity. I wouldn’t expect MSNBC to air it anytime soon.